Aug 1945, the US drops atomic bombs on Hiroshima and Nagasaki killing at least 150K people in 4 months. In the 1970’s Japan partners with GE and Westinghouse, copies their designs and starts working without them. March 2011, 3 reactors meltdown at Fukushima, 210K people evacuated from area. July 2012 and onward – weekly anti-nuclear protests draw tens to hundreds of thousands. March 2011 thru Dec 2012, Japan has no blackouts, no recession and the economy outperforms the US. Japan has highest GDP ever in 2012, despite almost the entire nuclear fleet being down the entire year. Dec 2012 Japan elects a pro-nuclear government due to fears of China and economic concerns. Sept 2013 two Oi reactors are closed again, Japan is nuclear free, industry predicts blackouts. [Update] Sept 2014 New Japanese nuclear regulator (NRA) approve 2 Sendia reactors for restart (despite siesmic and volcano problems). But PM Abe has an uphill battle to get them started, communities in the south-western Kagoshima prefecture, must approve the plant and they are not inclined to. 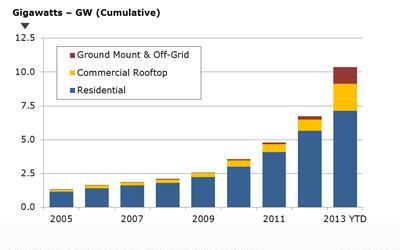 [Update] Sept 2014 No blackouts for a year, Japan installs second largest number of solar panels after only China. Abe government contents economy requires reactors. [Update] Sept 2014 Japan replaces 13 reactors worth of power with reduced demand and 3 reactors with with new renewables. [Update] March 2016. A Japanese district court ordered the closure of the Takahama reactors 3 and 4, damaging the Abe governments efforts to restart reactors. So if you read the above timeline you will notice a common thread. Every time the utilities lose nuclear capacity they claim the country is facing blackouts or recession. And then these blackouts and recessions do not occur. Then the industry claims them again. Nestled among the items here is the government’s repeal of the fantastically successful energy savings program. So when they tell you in a panic that we must have these reactors, remember they are being coached by some of the highest paid PR people in the world, these things don’t come to pass and they depend on your ignorance of history and willingness to believe known liars to advance their agenda. of course, you are most welcome.